COURTS should become the last resort for separated families, according to reforms proposed in the biggest shake-up of the family justice system in almost 20 years. However, it will be up to politicians at Stormont to implement the judge’s recommendations, which he believes could radically improve outcomes for families and children. 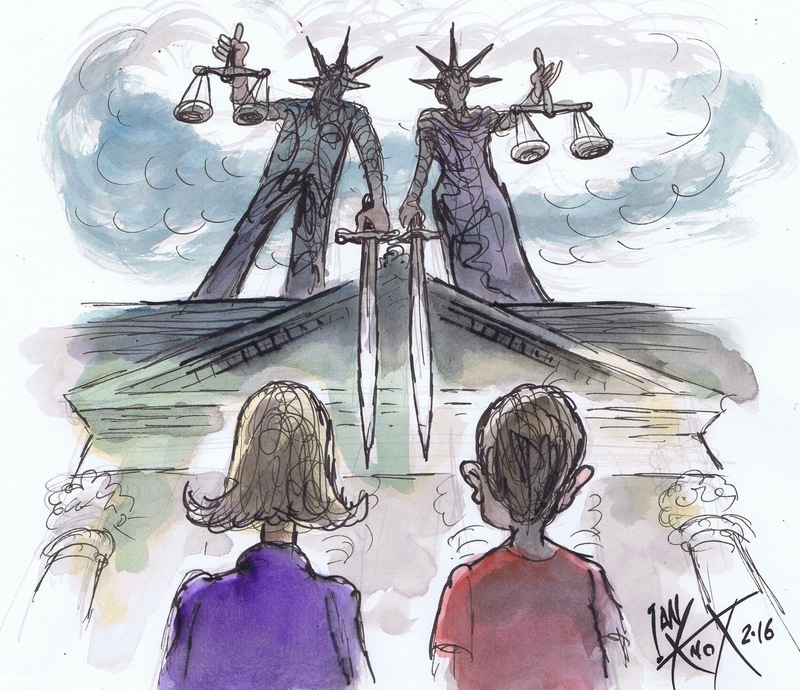 In his first media interview since the publication of the 250-page draft Family Justice Report, Lord Justice Gillen said a cultural change was needed so more families reached agreement outside of court. As part of the review Justice Gillen liaised with experts from around the world including New Zealand where separating couples are not allowed to go to court until they have engaged in a parenting discussion. “At that discussion children are absolutely kept to the fore,” the senior judge explained. His review highlighted problems with major delay and inefficiency in court proceedings, budget cuts, too many court hearings, and no formal training structure for family court judges. Previous research by Detail Data found that Northern Ireland’s family courts made more than 24,000 decisions impacting on thousands of children’s lives between September 2012 and August 2015 alone. An analysis of that data from the Family Proceedings Court, Family Care Centre and the High Court by Detail Data also revealed that 10,206 contact and residence orders were made during that timeframe – almost half of all orders. Orders for ‘contact’ and ‘residence’ generally set out which parent a child lives with and when they have contact with their other parent. Our previous story also revealed how private law children’s orders in 2013/14 cost the public purse £11.7million – in comparison Family Mediation NI received just over £200,000 in government funding that same year for pre-court mediation. Justice Gillen said the key to a successful family justice system was public confidence. “The only way you can do that is opening up the courts to the media so the public can find out what is going on – so long as you have appropriate protections for children within that system. “There is a tension on the one hand between the right of the child to have privacy, to have protection from the public knowing all about their little lives and anonymity is important. There are 168 recommendations in the draft report, which can be viewed here. The public consultation process closes on October 28 and responses can be emailed to [email protected]. Other key recommendations include having ‘problem solving courts’, a new family court structure, fast-tracking of cases and greater use of technology which would enable police officers and social workers to give court updates via the internet. Also problem solving courts – with the assistance of specialised support services including anger management, drug and alcohol addiction – will aim to help parents. New sanctions are also being proposed for parents who fail to adhere to a court order including community service and mandatory parenting classes similar to those for people caught speeding. The recommendation is for a similar scheme for “warring parents, fighting over contact, fighting over whether children can be seen”. Justice Gillen has said the community and voluntary sector has already played and will continue to play a key role in the reforms. Many groups including Family Mediation NI and the NSPCC formed a reference group advising Justice Gillen. “We had them all on board, their enthusiasm was absolutely fantastic and I found them an enormous encouragement,” he said. Detail Data’s previous research prompted calls for a greater focus on mediation and lead to the formation of a Family Courts coalition. Facilitated by NICVA, the coalition brings together voluntary and community groups which are working in the family court arena. Through the coalition the groups are lobbying for reform of the system, more funding and greater support for mediation in an effort to divert more families away from the justice system. Several issues highlighted in Detail Data’s story in April have been cited in the review group’s recommendations including replacing the “outdated” Children’s Order Advisory Committee (COAC) with a new Family Justice Board, giving greater emphasis to the voice of the child and opening the family courts up to the media. The review and reform of Northern Ireland’s family justice system has been welcomed by groups working in the voluntary/community sector. Neil Anderson, head of NSPCC Northern Ireland, said: “The Court Service is facing a range of new challenges and emerging issues. Court facilities need modernisation so they can benefit from digital technology and communications. We also face more complex public and private law cases in a time when there is less funding. “NSPCC Northern Ireland is particularly supportive of the recommendations on new ways to provide mediation for family cases. Joan Davis, director of Family Mediation NI said: “Justice Gillen’s far reaching review has concluded that the Separated Parents Information Programme in New Zealand may influence the development of a similar approach in Northern Ireland. We are encouraged by this vision that acknowledges family breakdown as not a legal battle but a societal issue that requires urgent intervention to reduce the negative impact on children. After the final report is handed to the Lord Chief Justice this autumn it will be up to the government to implement the recommendations. Justice Gillen stated: “If these reforms are carried through and if we have a court system which is swifter, more efficient, a one-stop shop, problem solving - you will find that the savings are enormous in terms of children being kept out of the criminal justice system. To read the full interview with Justice Gillen click here. Click here to read our previous family court articles. It is the first major review in almost two decades of Northern Ireland’s family courts. However, it will be up to politicians at Stormont to implement the judge’s recommendations.